A beautiful collection of artist Peter Gossage's beloved Maori myths, in one stunning volume. Peter Gossage's memorable retellings of Maori oral myths have captivated the children of New Zealand for generations. Their dramatic and distinctive illustrations with minimal yet evo... read full description below. Peter Gossage's memorable retellings of Maori oral myths have captivated the children of New Zealand for generations. Their dramatic and distinctive illustrations with minimal yet evocative language form a powerful combination, and each has earned its place among the beloved classics of our literature. These are exciting, magical tales of adventure and intrigue. 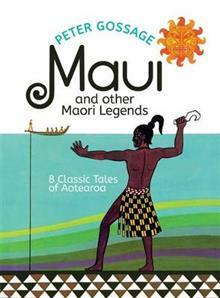 Several feature the remarkable culture hero Maui - the quick-witted and the trickster - whose exploits include slowing the sun in its course across the sky, fishing up the North Island/Te Ika a Maui, discovering the secret of fire and his attempt to trick the goddess of death and become immortal. Peter Gossage is the storyteller and illustrator of more than twenty published picture books, including myths such as How Maui Slowed the Sun, Battle of the Mountains and Pania of the Reef. His distinctive artistic style is loved by adults and children alike, and his retelling of old and interesting myths is done in such a way that they are easily accessible to readers of many ages. Peter lives in Auckland.